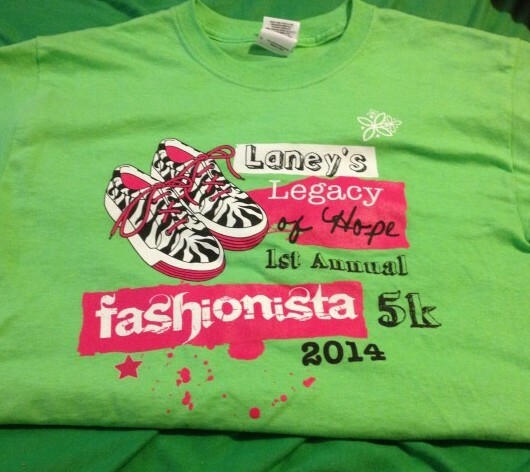 Back in June, I was asked to design the t-shirts for the first annual Fashionista 5k Run for Laney’s Legacy of Hope. I was delighted to be apart of this historical event since I knew the family and actually grew up with Laney’s father. Delaney Brown was a beautiful, cheerful little girl who’s life tragically ended too soon when she was diagnosed with a rare form of Acute Myeloid Leukemia. She valiantly fought a 7-month battle but succumbed to the disease on Christmas morning 2013, five days after her eighth birthday. Laney’s favorite things included anything zebra, pink and purple! And so I created a fun, spirited design that captured Laney’s personal style. I am truly honored to have contributed to this wonderful cause!